Go LPG is defeated in court! Phone call from another unsatisfied Go LPG customer! They say that lighting doesn't strike twice, however, I couldn't believe my ears when in February 2008 I received a phone call from a distressed gentleman in Dorset who had purchased a Jaguar vehicle from Mr Steven P Sparrow of Go LPG. The gentleman was given my number by Alternatech Fuel Systems Ltd as he found their details on this site. Just a few days earlier LPGinfo had received a legal threat from Mr Steven P Sparrow of Go LPG - it didn't take a genius to put 2 + 2 together and work out that he wanted to pull down LPGinfo before the gentleman from Dorset could find it! Go LPG's pre-converted Jaguar for sale - looks good from afar doesn't it? But what lies beneath?! When running on LPG the vehicle kept cutting out and did not perform anything like it should on petrol. This made it dangerous to drive and so the gentleman feared for his safety and parked the vehicle up on his driveway after driving it for only around 1000 miles. There was a strong smell of gas coming from the vehicle. Lifting the bonnet and examining the engine bay showed that carpet tape and bubble wrap had been used around the inlet manifold. The vehicle history/docmentation did not appear to be in order - it was alleged that the vehicle was bought by Mr Steven P Sparrow of Go LPG in September 2007 and converted to LPG by Mr Steven P Sparrow of Go LPG in October 2007, however, the MOT certificate showed that the vehicle was presented for testing on LPG in August 2007, before the actual LPG conversion had been carried out! Rejected the vehicle and wrote to requested his £4995.00 back (the amount he paid for the vehicle) from Mr Steven P Sparrow of Go LPG. He refused to take the vehicle back. An Independent inspection carried out by a non-LPG Installing garage which mentioned a strong smell of gas indicating a possible gas leak. He sent this, by Recorded Delivery, to Mr Steven P Sparrow of Go LPG. An Indepenent (LPGA Approved) inspection carried out on the vehicle by Dorset LPG who failed the vehicle according to the LPGA's COP-11 Code of Practice. Launched a Small Claims Court Case against Mr Steven P Sparrow of Go LPG to get his money back as written responses from Mr Steven P Sparrow of Go LPG had dried up and when speaking to him on the telephone, the gentleman alleged that he was told to F*** OFF! Great customer service huh? So why had the gentleman contacted me? He had comes across my site and wanted to know about my dealings with Mr Steven P Sparrow of Go LPG. He didn't think he had a great chance of winning and wanted some help. I, obviously, offered my assistance in terms of telephone advice, the telephone number of my Solicitor in case he wanted legal advice and even offered to accompany the gentleman to the Small Claims hearing at Worcester Combined Court on Friday 11 April 2008 - it's the least I could do given the ordeal I had with my conversion to LPG by Mr Steven P Sparrow of Go LPG and I did not want anyone else to be ripped off by him. The hearing was scheduled for 10am and I arrived to meet the nervous gentleman just before we were to be called in before the Judge. We were then lead into the Judge's chamber where my role was to simply accompany the gentleman. Opposite the gentleman and I, sat Mr Steven P Sparrow of Go LPG; accompanied by 2 males and 1 female. Adjacent (on the right) to Mr Steven P Sparrow of Go LPG was what seemed like a female Solicitor; adjacent to her was Mr R McCarthy (identified to the Judge as an Independent Jaguar Specialist) and adjacent to Mr McCarthy was Mr C Seeney (identified to the Judge as a Senior Engineer from Autogas Worldwide Ltd - they supply the Romano equipment to Mr Steven P Sparrow of Go LPG and others). Firstly, the Judge asked the gentleman to elaborate his case about why he was not satisfied with the vehicle and to justify this with the evidence that he had previously sent in (both parties are required to send the Court and each other their corresponding evidence, prior to the hearing). The Judge listened and asked questions where he felt appropriate. Mr Steven P Sparrow of Go LPG was simultaneously being advised by what seemed like his Solicitor, mentioned previously. The Judge then requested Mr Steven P Sparrow of Go LPG to ask the gentleman questions and elaborate his defence.Mr Steven P Sparrow of Go LPG asked the gentleman to clarify the difference between the mileage on the vehicle when he purchased it and the mileage at the time of the hearing. The gentleman worked out the difference in mileage to be around 1000 miles and Mr Steven P Sparrow of Go LPG tried to labour the point that if the vehicle was not working correctly, why had the gentleman driven it for around 1000 miles. The gentleman countered this by stating that it was around 250 miles from location of Mr Steven P Sparrow of Go LPG to his home in Dorset and the remaining 750 or so miles were comprised of trips to Independent Specialists to get the car tested and so the approximate 1000 mile figure was over a period over 6 months! Mr Steven P Sparrow of Go LPG then proceeded to explain his defence. His main line of defence was that the problems the gentleman had with the car were consistent with the nature of motor vehicles in that Check Engine Light (CEL) and ABS sensor faults (etc.) flagged up on the Jaguar's on-board computer (OBC) could come on at any point and did not mean that the vehicle had necessarily been sold with faults. He said that he had offered to fix some of the faults for the gentleman. With regards to the LPG, he did not acknowledge any of the problems that the gentleman was experiencing. The Judge proceeded to ask the first 'expert' witness of Mr Steven P Sparrow of Go LPG to contribute to his defence. The Independent Jaguar Specialist supported the previous claims of Mr Steven P Sparrow of Go LPG in that the faults that the Jaguar vehicle was showing were not serious. The Judge then asked the second 'expert' witness of Mr Steven P Sparrow of Go LPG to contribute to his defence. The representative from Autogas Worldwide Ltd provided a long account of how the equipment used was one of the best and how LPG conversions that Mr Steven P Sparrow of Go LPG carried out were compliant with LPGA COP-11 guidelines. If bubble wrap and carpet tape were suitable materials to be used in the engine bay around the inlet manifold? If the conversion LPG conversion done on the vehicle by Mr Steven P Sparrow of Go LPG was safe and compliant with COP-11 guidelines, why had it failed an Independent (LPGA Approved) inspection carried out on the vehicle by Dorset LPG? The answer given to this was that the bubble wrap and duck (not carpet!) tape could well be of the correct grade to withstand under-bonnet temperatures. The company (Dorset LPG) who carried out the Independent (LPGA Approved) inspection were not Romano trained/approved installers! Break for decision - Go LPG loses! After the hearing which lasted well over an hour, the Judge requested a short break to assimilate all he had heard and come to a decision. Everyone involved was subsequently recalled to the Judge's chamber. The Judge stated that he would explain his decision with regards to each point of complaint raised by the gentleman and that the overall decision of the Judge would be final. The Judge continued to dismiss the majority of the gentleman's claims as, in effect, consistent with the nature of motor vehicles, however, the Judge said that a crucial turning point in the case was when the gentleman sent Mr Steven P Sparrow of Go LPG the Independent report carried out by a non-LPG Installing garage which mentioned a strong smell of gas indicating a possible gas leak.Mr Steven P Sparrow of Go LPG refused to acknowledge receiving the report (even thought it was sent to him by Recorded Delivery) and as result he refused to take the vehicle back which the gentleman had rejected. With the above in mind, the Judge declared his decision in favour of the gentleman and against Mr Steven P Sparrow of Go LPG. The Judge then ordered that Mr Steven P Sparrow of Go LPG repay the gentleman (within 14 days) the cost of the vehicle which was £4995.00 plus the court costs of approximately £500.00. (Poetic) Justice had been served - Judge Dredd would be proud! The Jaguar vehicle has been returned and Mr Steven P Sparrow of Go LPG has refunded the gentleman £4995.00. 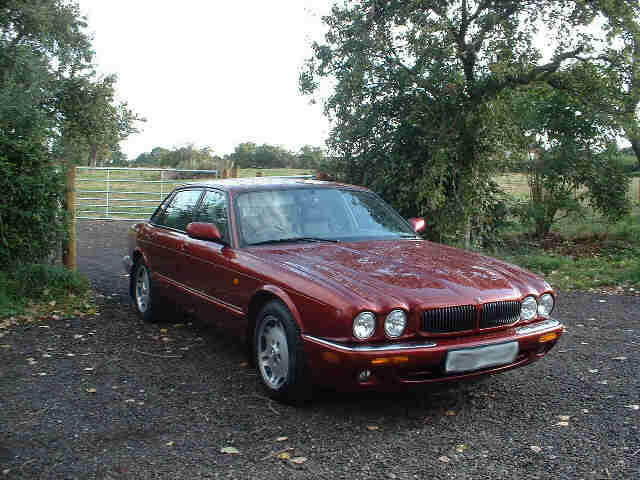 However, it is alleged that Mr Steven P Sparrow of Go LPG stated that the Jaguar acquired a 'scratch' whilst in the gentleman's possesion and that he has allegedly manged to wrangle out of paying around £250.00 of the approximate £500 court costs back to the gentleman to cover the costs of the alleged 'scratch'. The same Jaguar vehicle was recently back up for sale on the Go LPG website for £5495! It has come to the attention of LPGinfo that gentleman from Dorset has since set up a web-page to defend the 'character' and 'business' of Mr Steven P Sparrow of Go LPG. It is interesting he should do this once he has been helped by LPGinfo to win his case. I wonder how much that was worth?